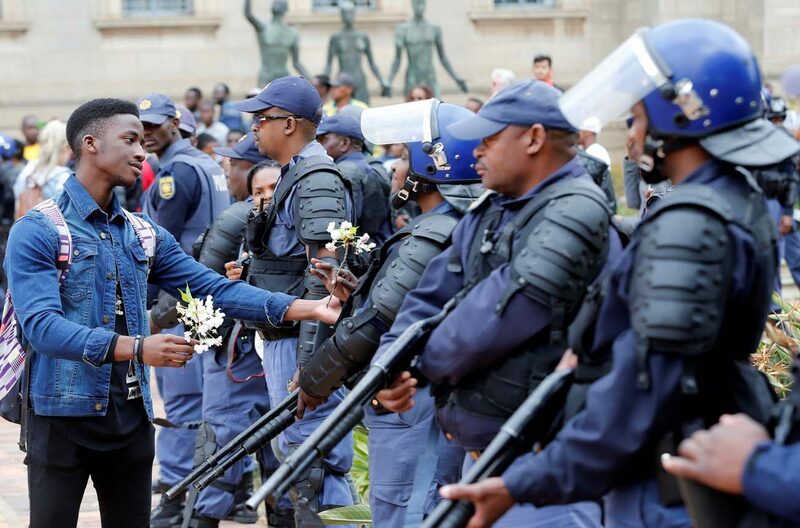 CAPE TOWN, South Africa (CNS) — As students and police clash at South African universities, with many campuses closed because of protests against fee increases, Catholic students called on the government to increase its education budget. The high cost of university education, unaffordable for most black South Africans, has become a symbol of the racial inequalities that remain more than two decades after the end of apartheid. In a day of violent clashes between students and security forces at the University of the Witwatersrand in Johannesburg Oct. 10, a priest was struck in the mouth by a rubber bullet fired by police. Jesuit Father Graham Pugin, university chaplain, was urging an end to the violence while standing outside his parish church, where protesting students were taking shelter when he was shot. He was treated at a local hospital and released. Protests at South African universities began in mid-September after the government capped 2017 fee increases at 8 percent, slightly more than the country’s rate of annual inflation. The government froze fee increases for 2016 in response to a campaign. With final examinations scheduled for November, most members of the Catholic students’ association want the universities to resume classes, Lucky Moloi, association president, said in an Oct. 10 telephone interview. “We are working hard to find a common way that serves all of us,” said Moloi, a third-year medical student at the University of Pretoria. Continued suspension of classes at many universities is “very frustrating and difficult” for students who want to complete their studies, he said. “Political parties have taken advantage of the situation” and are placing pressure on students to continue with the strike “despite knowing that most students want to get back to their studies,” said Mariannhill Father Mthembeni Dlamini, national chaplain to the students’ association. “This serves their political ends, not necessarily the interests of the students,” he said in an Oct. 10 telephone interview. “We believe free education is possible if the government takes responsibility” for providing this and restructures its priorities, the association said. It urged students to “work together in applying pressure on all sectors to contribute toward higher education,” noting that the private sector should contribute through higher taxation. The campaign for free university education “came about because students felt that higher education has become commodified, with university fees being very expensive and unaffordable for most” students, the association said. Student loans from financial institutions, which the government “appears to favor,” are a “far cry from any concept of free education,” it said. The government must implement measures that “will ensure state funds are not lost to corruption” and ensure that “parastatals are run by honest, qualified individuals,” it said. The Southern African Catholic Bishops’ Conference said the government’s capping of increases and pledge to increase aid to poor students “provide no lasting solution.” The bishops called on the government to give immediate attention “to poor students who are unable, or struggling,” to pay their current fees. Both the association and the bishops’ conference strongly condemned the violence and vandalism on campuses. The demonstrations have frequently turned violent, with police firing stun grenades, rubber bullets and tear gas at stone-throwing students. Several buildings, including a library, have been set on fire by protesters on campuses around the country. The bishops said they hope the government-appointed commission to probe the education-funding system “will come up with a realistic plan” for poor and working-class families to have ongoing access to higher education. They urged the private sector to seek ways to increase their financial support.